The tradition of yoga in the culture of Thailand derives from both Ayurvedic Indian healing and traditional Chinese medicine. Throughout the year, the Very Near Yoga Studio classes and private lessons will incorporate these more partner-assisted stretching modalities. Your experience in our classes will then allow you to share the practice of yoga with family and friends. Kathleen has been studying with teachers Michael (Mukti) Buck (director, the Vedic Conservatory) and Rose Griscom (director, Institute of Thai Massage - USA), both masters of Thai Yoga. 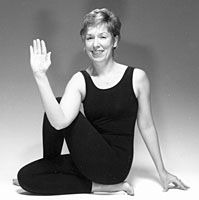 Kathleen's focus has always been in the style of Hatha Yoga and the study of traditional Thai Yoga is a perfect complement and extension of the discipline of yoga therapy. This age we live in creates a lot of wear & tear on the mind & on the body. Our classes are designed to teach the average adult (male & female!) how to cope. 3. Which yoga poses specifically address chronic ailments such as the onset of osteoarthritis, hypertension, cardiopulmonary diseases, glucose metabolism, interrupted sleep cycles, etc. Very Near Yoga Studio classes are held in a quiet, intimate space. Classes are no larger than 8 students. Class levels are mixed, props are provided to assist students in developing strength, balance, flexibility, and endurance. You can, therefore, develop at your own pace. All classes include 15 - 20 minutes of relaxation to foster the art of meditation. Yoga takes the individual student step-by-step to under-STAND the technique of coming alive to one's own balance, strength, and flexibility. Life is rushed and some yoga classes are taught in a fast-paced, rushed manner that does not contribute to learning on a deep level. Yoga is slow, steady learning process that extends your brain from the bottom of your foot to the top of your head. This takes time!